Think deeply about this: What activity did Toyota employees engage in to eventually get to what became known as the Toyota Production System and The Toyota Way? But, not just any type of kaizen. 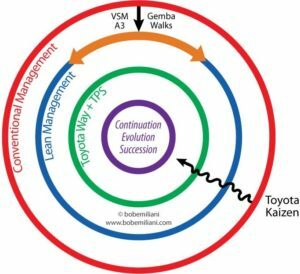 It was Toyota’s own creative adaptation of kaizen to meet its evolving business needs, which was (and remains) rooted in industrial engineering (IE) methods. It is important for all to understand that it was IE-based kaizen thinking and practice that led to offshoots such as value stream maps, A3 reports, gemba walks, and so on. The order of precedence matters. And so too does the realization that Toyota’s basic business needs and its basic customer needs are nearly identical to your own. That is why you should practice Toyota-style kaizen. The illustration above shows that the first major step to a more progressive type of management practice is Lean. The employees of conventionally managed business begin to use some Lean tools in the hope of great success. But in most cases, they never move beyond Lean because they use Lean tools outside the context of kaizen. So instead, they go around and around the Lean circle, for years if not decades, and never come close to The Toyota Way and the Toyota Production System. 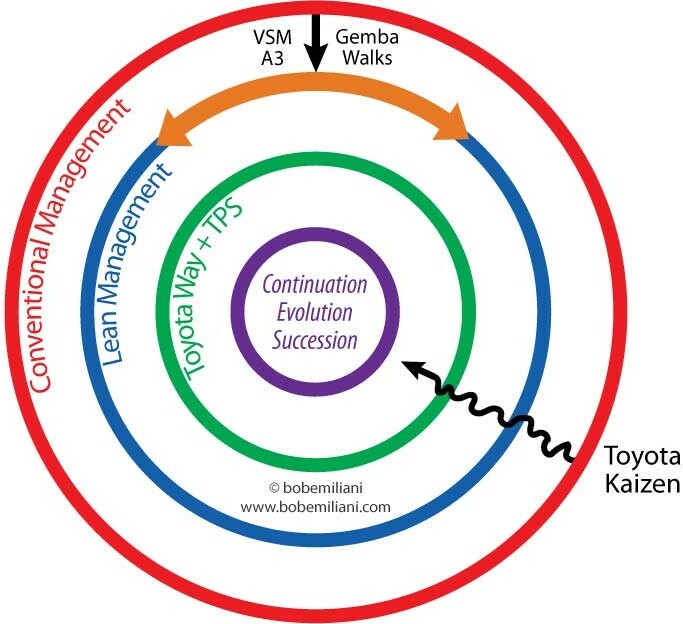 Toyota kaizen, based on trial-and-error experimentation, is a meandering path of discovery and learning to find the method(s) which, at any point in time, results in the lowest cost (and thus highest quality and shortest lead-times) as market conditions change continuously. Through diligent daily application of Toyota kaizen, The Toyota Way and the Toyota Production System continue to reveal themselves in this infinite journey of vast discovery and learning. Toyota kaizen, inclusive of its continuous evolution, is the one best way to experience this infinite journey. In contrast, the discrete application of Lean tools, such as value stream maps, A3 reports, gemba walks, and so on, are a different, finite journey of limited discovery and learning. Think of Lean as limited discovery and learning, and therefore limited business results. The journey does not end with The Toyota Way and the Toyota Production System. It continues to the next phase of evolution and succession from one generation of practitioners to the next. Knowing that when kaizen stops, everything stops, its practitioners confidently push forward into uncertain territory – because continuously changing conditions require it – knowing that the invisible will become visible with each step they take on their infinite journey. Think deeply about this: Are the activities you are engaged in moving you to The Toyota Way and the Toyota Production System, and beyond? Likely, it is not. Therefore, you would be wise to change your focus to Toyota kaizen. Click here and here to learn more about Toyota’s kaizen mindset and methods. It continually frustrates me when most hospitals who say they are, ahem, “implementing Lean” aren’t really doing anything to engage everybody in Kaizen. It’s such a lost opportunity. I saw an old Monden article today where TPS was basically equated with JIT, kanban, changeover, etc. Nothing really about the human element. That article pre-dates the term “Lean” of course. I know. People who studied TPS focused on the results, not the human-centered process – kaizen – that created the results. It was a common point of analysis, though in hindsight it was obviously incomplete.